Dahlia wall lamps, designed by Janne Kyttanen and Jiri Evenhuis. 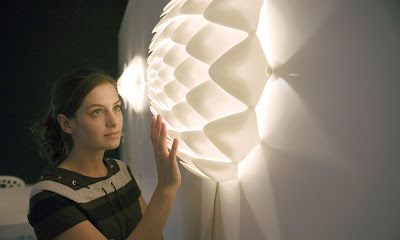 Design should be the focus of attention for Dahlia, with its softly illuminated chrysanthemum-like petals, but how it's made, using stereolithography to 3-dimensionally "print" this lamp, is equally compelling. Freedom Of Creation is proving without a doubt that with these RM tools and materials they are free to create anything. In fact, in addition to the new lamps, they've now expanded into fashion accessories. Punchbag, a handbag and Paris, customizable evening sandals, are both made of polished polyamide using rapid manufacturing techniques. 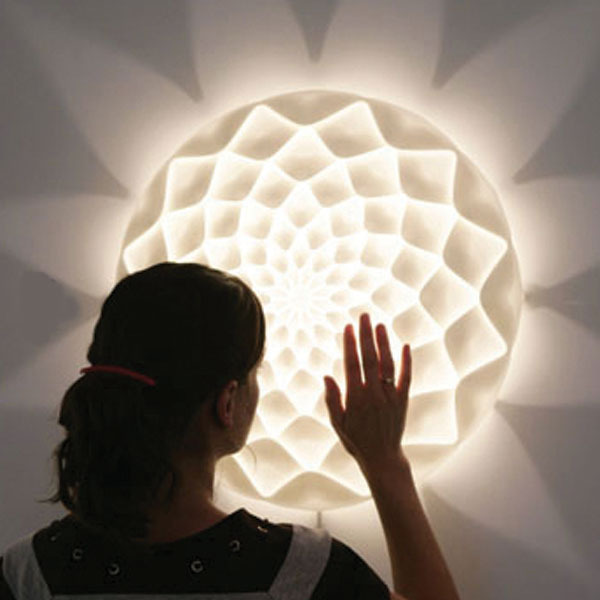 Dahlia is inspired by themathematics of nature and arrangement of flower petals. It leaves an astonishing shadow on the surface where it is mounted and a very subtle light on the petals.